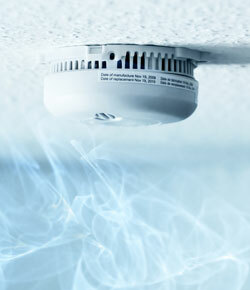 It may sound like a cliché but a simple, inexpensive smoke detector and fire alarm can be a life saver. The fire service recommends at least one smoke alarm should be installed on each floor of a building. Whether you are a home owner or a landlord, it couldn’t be easier to protect the people in your property. AC Electrical Services has been doing just that for more than two decades. We will give your property a professional appraisal and deliver a bespoke solution based on your individual needs. We can install an up-to-date wireless or analogue detector offering complete protection, or an addressable system offering detailed information about the source of the fire. Talk to a friendly expert about a fire prevention solution. AC Electrical fitted smoke detectors in my house. Tony’s service was very professional (and very tidy). I would recommend highly.